Two places in Ipoh that will keep you coming back. I FIRST heard about Up & Up Restaurant from this girl I met during the audition round of a beauty pageant two years ago. We were waiting for our turns to enter the judging room, and she struck up a conversation with me after learning about the nature of my work. The restaurant belongs to her parents and they have been running this food business for more than 30 years. At that time, fish head curry didn’t sound very important – making it to the final round of that beauty pageant was. But over those two years, I learnt that tucking into hearty meals of fish head curry and rice was way more satisfying than starving myself just to fit into a tiny bikini. Finding Up & Up Restaurant wasn’t easy, especially when you’re not from Ipoh, and I drove by Wisma Kinta along Jalan Yang Kalsom twice before I noticed it. The name Up & Up was apt – we had to walk up three flights of stairs to get to the restaurant. You can take the elevator, which sometimes works and sometimes doesn’t. Outside the restaurant, I was greeted by a delicious aroma of assam curry confirming that I was at the right place. I ordered the Fish Head Curry (RM55 for a whole fish head), Sambal Prawns with Petai (RM18) and Foo Yong Egg (RM6) to share with my eating companion. The fish head came with plenty of tomatoes and okra in a tangy assam-curry gravy that begged to be poured over white rice. I liked that the gravy was sour and spicy with a touch of coconut milk. Alas, only the gravy made an impression as the fish was undercooked – we sent it back to the kitchen to be re-cooked. 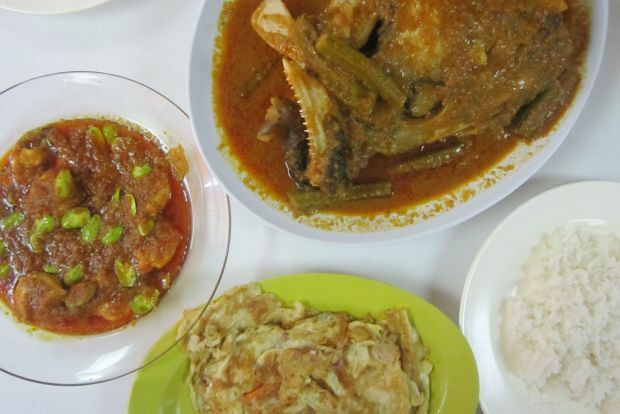 What knocked our socks off was the Sambal Petai – it was the best we had eaten so far. This dish was the perfect balance of sweet, sour, spicy and salty, with a pungent aroma from the petai and belacan. The sauce was rightly thick while the prawns were large and succulent. You can do away with the petai, but I feel you’d be missing out big time. My honey lime drink was most refreshing, especially after such a curry and carbo-laden meal. I was tempted to order the pork trotters but three dishes were already a bit much for us both. Next round, definitely! Lunch came to slightly over RM80, which I found expensive by Ipoh standards. Up & Up Restaurant (non-halal), 39-43 3rd Floor, Wisma Kinta, Jalan Yang Kalsom, Ipoh, Perak. Tel: 05-241 7089/05-255 6478. Closed on Sundays. 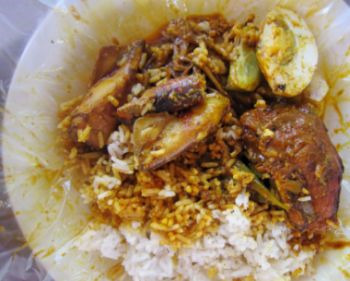 No Ipoh food trip is complete without eating Nasi Kandar Yong Suan, also known as Nasi Ganja, probably because the rice is incredibly addictive. The queue in Yong Suan Restoran can be very long, depending on what time you get there. I popped by at 1.30pm and still had to wait a good 20 minutes to order. There were no seats left, not even tumpang seats, so I had no choice but to have my rice packed. More than 18 dishes are on offer, but the signature dish here is the Ayam Merah – chicken, marinated with spices, fried and coated with thick curry gravy. A popular combination is rice with ayam merah, salted egg and kuah campur. The nasi kandar at Yong Suan Restoranis to die for! Greed got the better of me and I had the chicken, salted egg and squid curry with my rice. I also asked for kuah banjir to make sure the rice was thoroughly flavoured. This nasi kandar is different from the Penang version; I found this more lemak and spicy. Be prepared to sweat buckets and have a cold drink on standby. The ayam merah was richly flavoured from the spices, and tender. I enjoyed every bite of this. Also delicious was the squid curry – the gravy was thick, creamy and fiery while the squid was not overcooked, resulting in its succulent yet meaty texture. The salted egg wasn’t special, but it was a good addition to the nasi kandar. I mashed my egg up and mixed it with my curried rice. Shiok! My packet of rice cost RM10, which I thought was reasonable as they were generous with the squid curry. If you’re planning to take premium items such as prawns, expect to fork out more for your meal. Nasi Kandar Yong Suan aka Nasi Ganja (halal), Rumah Tumpangan dan Kedai Kopi Yong Suan, 2 Jalan Yang Kalsom, Ipoh, Perak. Tiong Sue Lynn blogs at www.bangsarbabe.com and tweets at twitter.com/bangsarbabe.